In 2017 I left a successful career as a restaurant manager to work for myself. Hospitality, when done well, is an act of endurance; of tirelessly putting out fires. After two decades of rewarding but unceasing work in the hot zone, my personal life was collapsing under the pressure. My partner and I simultaneously decided to resuscitate our aspirations of careers in writing, a dream I had suppressed to better choke down the pill of conventionally-accepted maturity, and the financial stability presumed to go with it. I now resolved to clear the overgrowth from my path, despite the back-breaking work before me. It had been years since I had written more than a long-winded Facebook rant. I had no connections. I felt my talent had atrophied. We had saved up a bit of money, but knew it would go faster than we would hope. We agreed that six months of concentrated effort would be necessary to make an informed decision as to our prospects. If progress had stalled, was sporadic, or trivial, we would reevaluate. Self-sufficiency in this new endeavor would be elusive, and far from assured. We had enough to comfortably cover about three months if we stayed in Pittsburgh, but with no real ties to the region, we were inspired to look South for our rehabilitation. After researching cities in Central and South America, the pool was narrowed to Buenos Aires, Argentina and Cuenca, Ecuador. Both cities had a myriad of requirements we had considered non-negotiable: temperate weather, drinkable water, English-speaking expat communities where our slowly-accumulating Spanish vocabulary would be less brutally judged. Yet they were vastly different. Buenos Aires is a modern, cosmopolitan city of 3 million situated on the Atlantic Ocean. Cuenca is historic, a UNESCO World Heritage Site, and just a third the size. Its 350,000 inhabitants are situated 8,500 feet high in the Andes Mountains. Argentina would provide more varied nightlife and better public transportation. 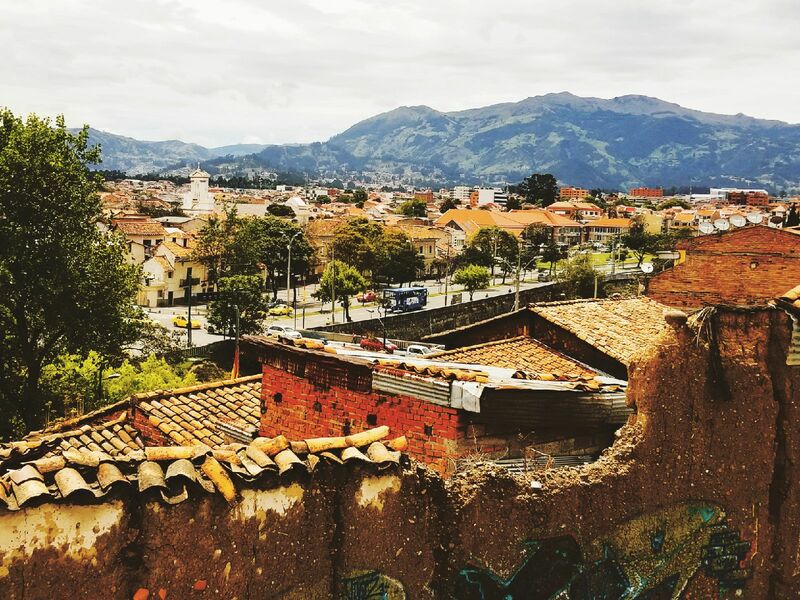 Cuenca uses the American dollar and is immensely walkable. Argentina has a cost of living twice that of Cuenca’s, but they also have a postal system. We agonized over making the right decision. That is, until we didn’t. I had given my partner a tarot reading for his birthday. Still suspended in indecision, he asked his reader what the cards would suggest. They declared Ecuador the favorite, and with that our course was chosen. We discussed our plans for Ecuador at lunch afterwards. For a month we had argued the pros and cons of the two cities, our advancement blocked by uncertainty. Now we were mobilized, organizing tasks that needed completing, becoming more animated as we conversed. I realized then that neither choice was better or worse for our outcome. I could have just as easily arranged each of these tasks with Argentina as our set destination. What had released me from the mire was our resolve. We are taught that our decisions are what determines the quality of our lives, when really, it is the making of those decisions that is responsible for what we achieve. We waste our efforts on the tireless weighing of options, incorrectly perceiving our chances of success to be significantly swayed by our choices. That energy, when put forth in the actual carrying out of our plans, is far more indicative of whether we will thrive than whether the specific goal we chose had the best potential. The word decide stems from the Latin decidere, meaning “to cut off.” The difficult choices, the questions that plague us, are never resolved correctly if they are resolved without conviction. It is our commitment to a business, a service, a partner, that makes the work register as rewarding. In his TED talk, “Why Are We Happy?” Dan Gilbert popularized the concept of synthetic happiness. It is the mind’s unconscious ability to reframe the world so that the circumstances of the situation one finds oneself in are viewed as preferential. However, the mind is only convinced of this when the opportunity for continued choice has been eliminated. In order to maintain a feeling of confidence in our selections, we need to cut ourselves off from other available avenues. We have infinite possibilities in this world, but the inability to fully abandon our alternatives impedes our success in pursuing whichever we have chosen. However, the benefits to certitude are more encompassing than merely bestowing one with a positive perception. When a choice is fully embraced, the allowance for failure is removed. Rejection is easy to tolerate in abstraction, but the reality of consistent repudiation can be a hollowing experience. Making concessions for future defeat may seem pragmatic, a blueprint for rebuilding in case of failure, but in practice, inspires less devotion to the task. The initial creation of a set of goals presumes a level of motivation. Executing any goal sans net, before a live audience, is more likely to end in its triumphant achievement than whether the routine was performed on the trapeze or the tightrope. Having intelligent goals is important, and having a deep desire to fulfill them matters, but choosing the correct one to pursue is often a fallacy. If you are at an impasse after research and a week or two of envisioning what each outcome would feel like, if your gut doesn’t pull you toward one over the other, just choose. Though we pour over many of our decisions in search of right and wrong, they are rarely attributed with such moral values. The attention you devote to your goal is ultimately what will incite its realization. Had I stayed in Pittsburgh, I would have undoubtedly received offers from well-meaning associates. A few bad days, or weeks, or months and those offers could easily have drawn me back to my previous career. For now, I’m enjoying the city of Cuenca. Keeping my head down. Doing the work. It’s a scary thing, to command yourself to persist in forging a path, when you can hear the traffic of a road running alongside, just past the trees. In six months I’ll survey the path I’ve cleared, and may have to adjust course, but even a scenic route gains so much more than waffling at the fork. Yvette Benhamou is a freelance writer and contributing editor at twobytour.com whose passions include mezcal, sandwiches, and making misogynists uncomfortable.